Monday has finally arrived, you guys! 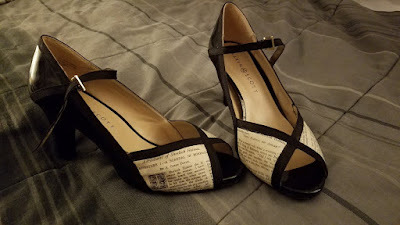 Tonight, I will be strutting in style at the Goodreads Choice Awards Ceremony in NYC. So today, I will be spending most of the morning freaking out about it and pulling my final outfit together. I'll be rubbing elbows with Goodreads staff, authors, and fellow site users like myself. There will be appetizers, drinks, and awards!! I can't wait!!! Working for a used book store, I would bring home the books they wanted to throw away. I just could not see them taking a dive in the dumpster. Eventually, I had to come up with an idea to recycle them. I found directions on how-to-make-your-own book purse and I knew that was it. Well, following those directions, I ended up making a HORRIBLE book purse. Nothing like the photo that was shown. After many mishaps and lots of improvements, I was able to make a book purse and good enough that family and friends wanted me to make them one! Because of my love of books, it was time to start sharing this creative bookish accessory with other book lovers and my Etsy shop was born in the year 2008. My book purses have been showcased numerous times on BuzzFeed, Geek.com, Chicago Times, L.A. Times, USA Today and Horror Finds. The most identifiable thing about me, beside my awesome rambunctious boys, is my purple Mohawk. Being stopped often about either my hair or my scarf, I knew marrying the two was the perfect option for my little shop. After selling scarves locally I decided to venture out not only on Etsy but with what I handcraft for purchase. The profit I make goes toward my growing boys, participating in operation Christmas child, and our hobbit style home building process. Unique items for the book lover's home and wardrobe. This is the one piece of my outfit I had to design all on my own. 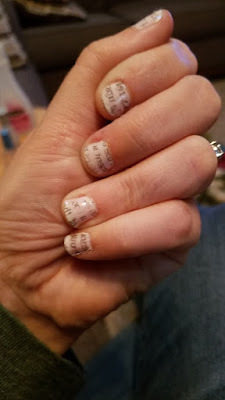 The video makes it seem super easy... and I assume with lots of practice I can probably get them to come out better, but not a horrible first attempt. Keep in mind I NEVER wear nail polish and when I do it typically looks like a six year old applied it, so I'm pretty chuffed with the results. heheheh. I decided to keep the dress super simple. It's a sleeveless black slip dress (with pockets!) and I'll throw on a black waist belt with a silver buckle to round it all out. I promise to share photos later this week so you can see how it all comes together. But right now, it's time to have a panic attack about how I'm going to wear my hair and makeup! As a long-time user and active moderator on the Goodreads website, I've been dubbed a "Power User", which is pretty badass all on its own, right?! Some of you may remember when they flew me and a handful of other users out to the California headquarters back in 2017 for a meet and greet with the team, and a brainstorming sesh? Welp, Goodreads is upping their game and hosting a Choice Awards Ceremony in NYC this coming Monday. It's invite-only, and sounds like it's going to be the bash-to-end-all-bashes - power users, authors, and Goodreads staff members will be there in full force, and I swear, it's been totally taking me back to those whole when-i-was-a-kid-and-i-thought-christmas-would-never-come days. To keep myself occupied and to make the wait for Monday a little less excruciating, I started searching the web for bookish attire... book-print dresses, scarves, shoes, whatever! I figure it this way... if I'm going to a once-in-a-lifetime book bash, I'm going to go in style! YOLO, biatches! 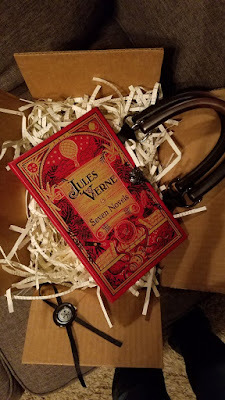 The Jules Verne Book Purse!!!! Just look at this thing, you guys! If you dig this purse, I strongly recommend you check out Karen's shop! Karen has been an absolute doll and the work she does is just amazing. Repurposed Book Purses and Book Clutches by Novel Creations. 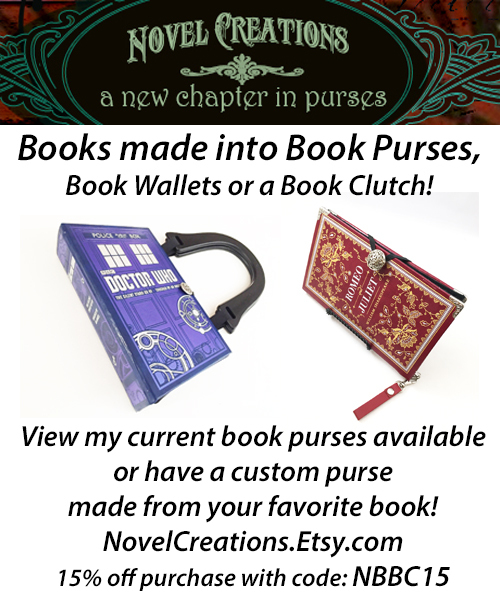 I handcraft these unique purses from actual hardback books and leather-bound books. 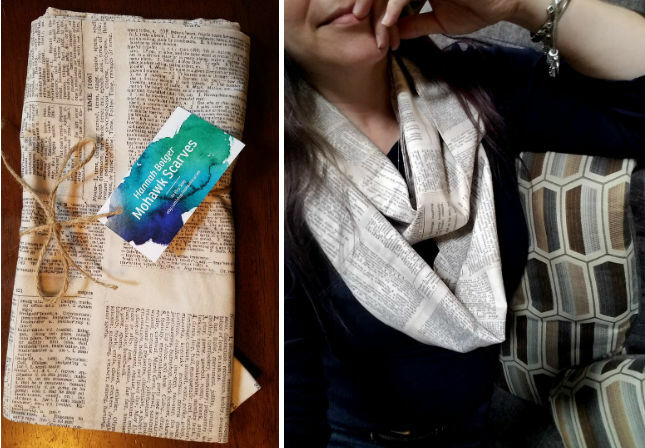 These recycled book cover handbags and wallets make for a special bookish gift idea, or the most eye-catching pocketbook you will own. A literary chic style that book lovers adore! Book-loving Brides, writers, and bibliophiles enjoy a wonderful way to show off their great taste in books and literature and lets you enjoy a piece of your favorite books and poetry as you go about your day. 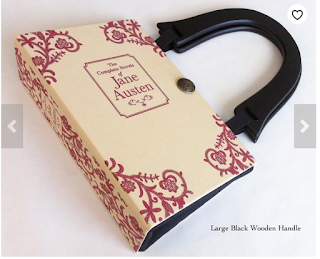 Now creating Book Wallets from mini-hardback books, mini-leather bound books and paperback books! And... as if she can't get anymore awesome... she's given us a coupon code to share with all of you! If you end up purchasing a book purse or clutch from Novel Creations, we'd love to hear all about it! Share in the comment section below! 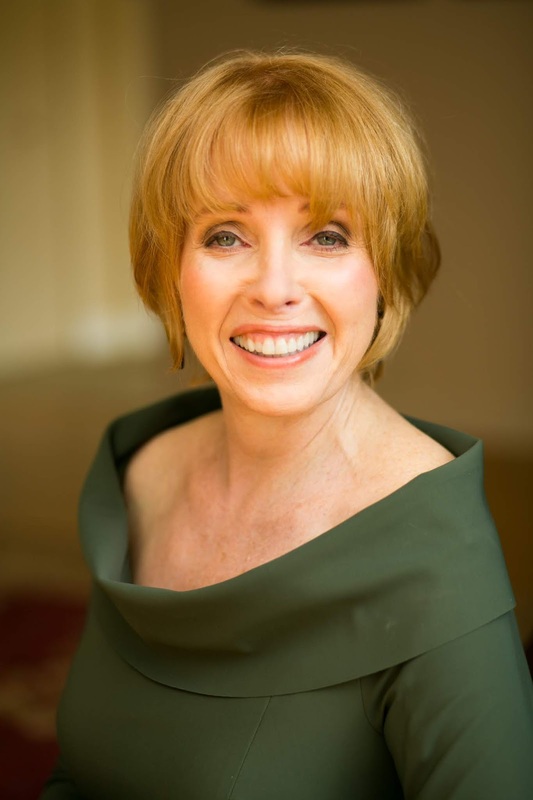 She is a former award-winning public relations executive turned author. Her debut novel, The Fourteenth of September, is a woman’s story of Vietnam which will be published this fall by She Writes Press. She is currently working on two other novels and a memoir in essays, all of which are based upon her interest in the impact of war on and through women, as well as on her transformative generation. 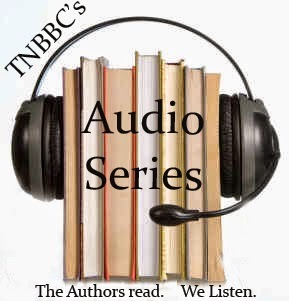 She also regularly hosts literary salons to introduce new works to avid readers. 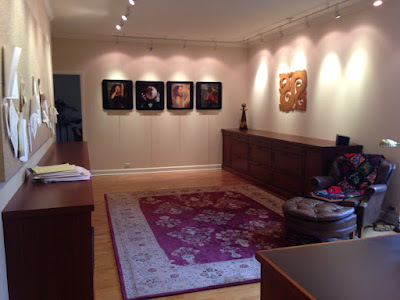 As I move off the cusp of transitioning from a consultant/part-time writer into full-time author status, I’ve been able to indulge a bit and turn my home office (a next-door condo) into a place with everything I always wanted in a writing space: lots of light, art for inspiration, a huge bulletin board for my outlines and notes, a giant desk, and lots of surfaces for all the stuff that surrounds a writer. What I particularly love are the ceiling-high bookshelves that make me feel like one of Max Perkins’s clients from the ’20s or ’30s. Hey, we’re writers . . . we imagine! Planning this ultimate space was part of a process. I still struggle with establishing an intractable minimum three hours in the early morning as a writing schedule. I’m convinced that’s what is required to produce consistent work, and it’s my goal. 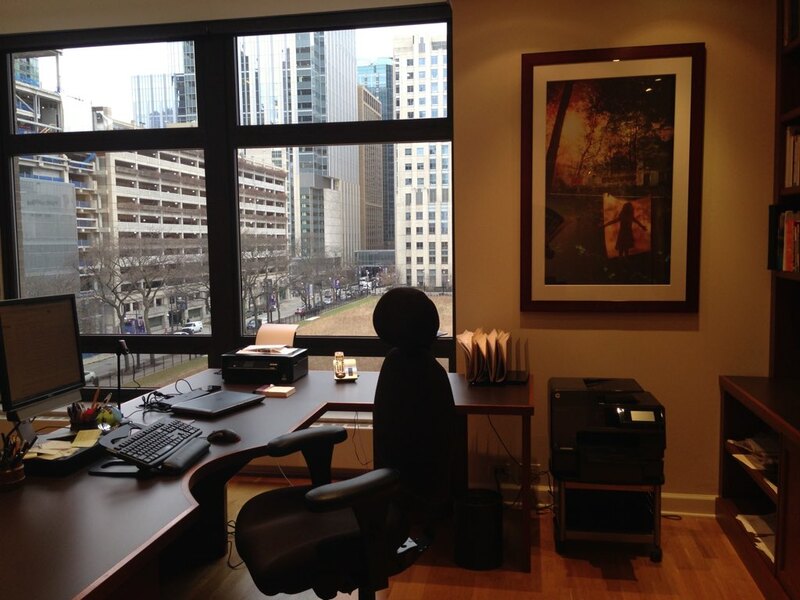 So, it was important to make my work space esthetically pleasing, inspirational, comfortable, and a pleasure to spend so much concentrated time in, day in and day out. For example, I’ve filled it with art—mostly from great friends, including the four photographs that face my desk from brilliant photographer Karen Thompson. Looking up to see that genius as I stare off into space helps keep me on task. Once I’m here, I never want to leave and only depart when my neck and back decide they’ve had it for the day. Practically speaking, after working on my dining room table for so long, I now am able to totally trash my work space (I’m a piler) and just close the door. What a luxury. But to get started each morning I also needed to make sure my work space was sufficiently alluring not only to work in, but also to get me into. I have a tendency to go through the “concentric circles of procrastination” (my term for, first, I’ll clean out the refrigerator or pay all my bills), and that all-important boost to get me out of my kitchen, away from my newspaper, and down to the work of writing has to be wonderful or, in my case, musical. Music was important to keep me in the mood while I was working on my novel, The Fourteenth of September. The story is set in the 1969-1970 time frame and those Soundtrack of Our Lives tunes are integral to the story. I can’t play music while I write (since I’d be singing along), but songs play in my head, scene by scene. 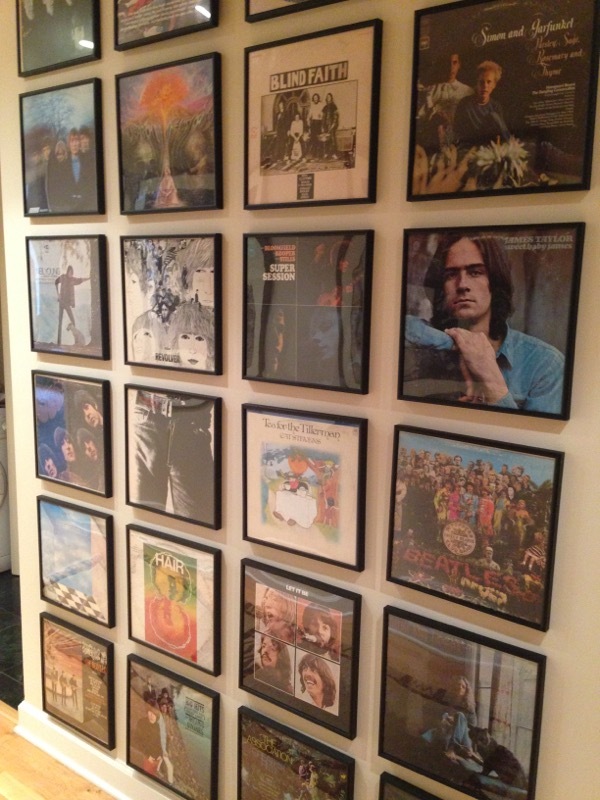 I have even taken the seminal vinyl albums of the time and preserved their covers on a full wall as if they were art—and some of them genuinely are (Revolver, In Search of the Lost Chord). 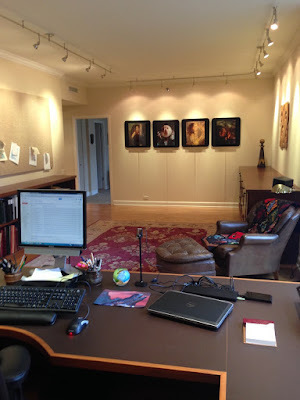 Knowing they are there, in the morning, after the newspaper, propels me towards my office. I open the door and pass the wall, scan the album covers and invariably a song “jumps out,” and lodges itself in the stereo of my mind to keep me company as I set up for the day…and I’m there. Today, Patrick Canning reads an excerpt from his novel Cryptofauna. Patrick was born in Wisconsin, grew up in Illinois, and now lives in California with his dog, HANK. Cryptofauna is a humorous, existential adventure packed with monsters, puns, and friendship. A high-speed collision of American Gods and The Hitchhiker's Guide to the Galaxy. Could be his job as a janitor at an insane asylum, could be the meaninglessness of existence, could be the unwanted cilantro on his tacos. Whatever the reason, Jim has elected to commit suicide. But before he can do the deed, a mysterious resident at work equips him with a dog and a bag of ash, and throws him into a secret game known as Cryptofauna. Cryptofauna is played by Operators, persons of special abilities who battle one another to influence important events around the world. To become an Operator, Jim must survive being stranded in the Pacific Ocean, pass a bizarre examination by leprous French monks, and pluck the existential splinter from his troubled soul. If there’s time, he must also stop a rival player from ending all life on the planet. Underwater Norwegian lairs, obsession with a decent pair of socks, and shapeshifting animals obsessed with AM radio all make up the strange world of Cryptofauna, which might help Jim discover a reason to live, assuming he doesn’t die in the process. 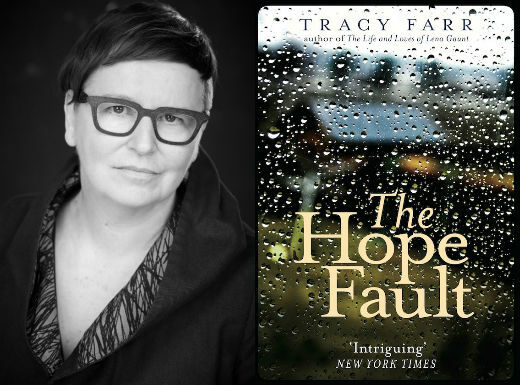 Today, Tracy Farr reads an excerpt from her second novel, The Hope Fault, published by Aardvark Bureau / Gallic Books. Tracy is also the author of the novel The Life and Loves of Lena Gaunt, and her short stories have won awards and been published in anthologies and literary journals. Her first novel and many of her short stories have been adapted for radio, and The Hope Fault is currently being adapted for the stage. 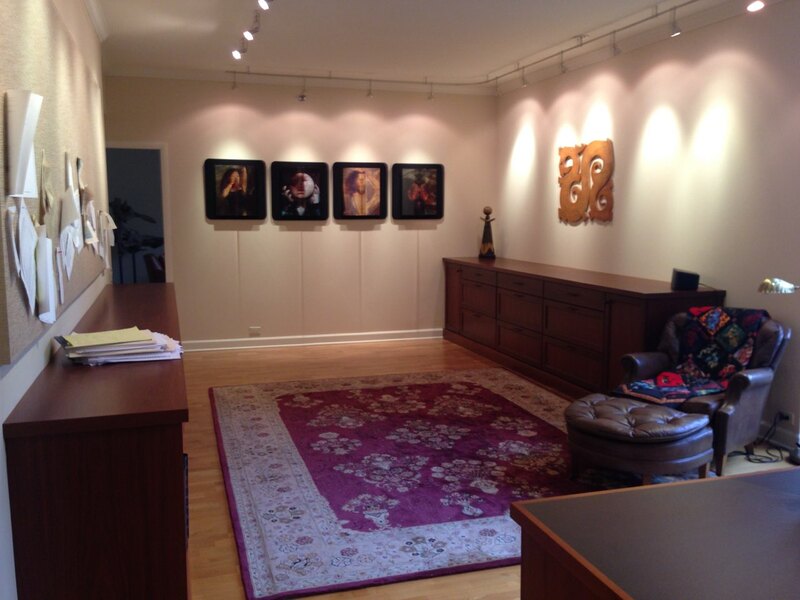 Originally from Australia, she’s lived in Wellington, New Zealand, for more than twenty years. You can catch her on Twitter or Instagram – she’s @hissingswan on both – or her website. In The Hope Fault, Iris and her extended family gather on a rainy midwinter long weekend to pack up, clean up and clear out their family holiday home now that it’s been sold, and to celebrate with one last party. There’s more to it than that – particularly in the novel’s middle act, which plays with time, and moves away from the family in the house – but the experience of this novel begins and ends with a sense of being with this family, in this house, doing the things that families do: eating and drinking, annoying each other, ignoring each other, worrying about each other, arguing and making up, keeping and revealing secrets. The novel is about the idea of home: how we make and unmake and remake a home; and how the notion (the who, where and what) of home can shift. It’s also very much a novel about anxiety and uncertainty, and the idea that the earth might shift, literally or metaphorically, at any moment, but we can’t know where or when; and we can’t know what the consequences – large or small or none at all – might be.